Mondal, Pinki; Jain, Meha; Robertson, Andrew W.; Galford, Gillian L.; Small, Christopher; DeFries, Ruth S.
India is predicted to be one of the most vulnerable agricultural regions to future climate changes. 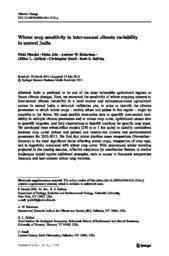 Here, we examined the sensitivity of winter cropping systems to inter-annual climate variability in a local market and subsistence-based agricultural system in central India, a data-rich validation site, in order to identify the climate parameters to which winter crops – mainly wheat and pulses in this region – might be sensitive in the future. We used satellite time-series data to quantify inter-annual variability in multiple climate parameters and in winter crop cover, agricultural census data to quantify irrigation, and field observations to identify locations for specific crop types. We developed three mixed-effect models (250 m to 1 km scale) to identify correlations between crop cover (wheat and pulses) and twenty-two climate and environmental parameters for 2001-2013. We find that winter daytime mean temperature (November–January) is the most significant factor affecting winter crops, irrespective of crop type, and is negatively associated with winter crop cover. With pronounced winter warming projected in the coming decades, effective adaptation by smallholder farmers in similar landscapes would require additional strategies, such as access to fine-scale temperature forecasts and heat-tolerant winter crop varieties.